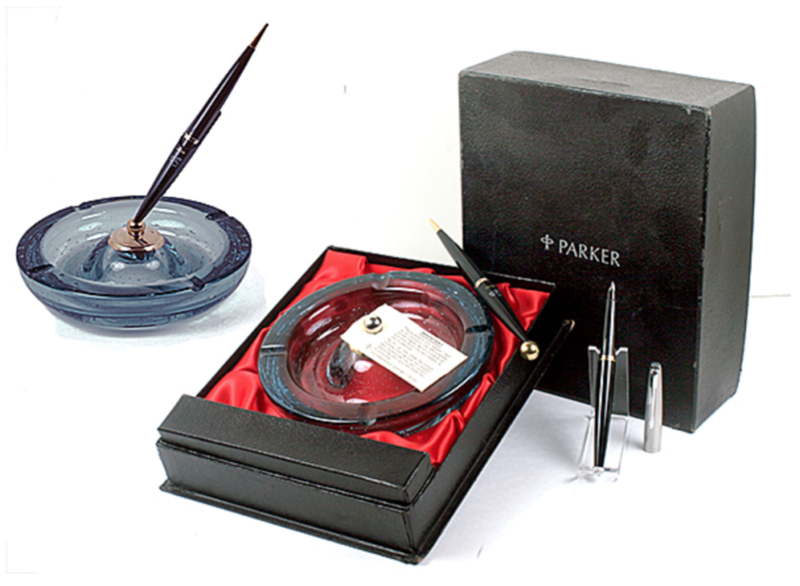 This is a 1950 Parker 45 “Whitefriars” convertible Ballpen/Fountain Pen Desk Set. 6″ round, deep Blue glass ashtray, easily used for paperclips, rubber bands, etc. Comes with Parker 45 Pen and Ballpen. One barrel, one tapered barrel, one cap. 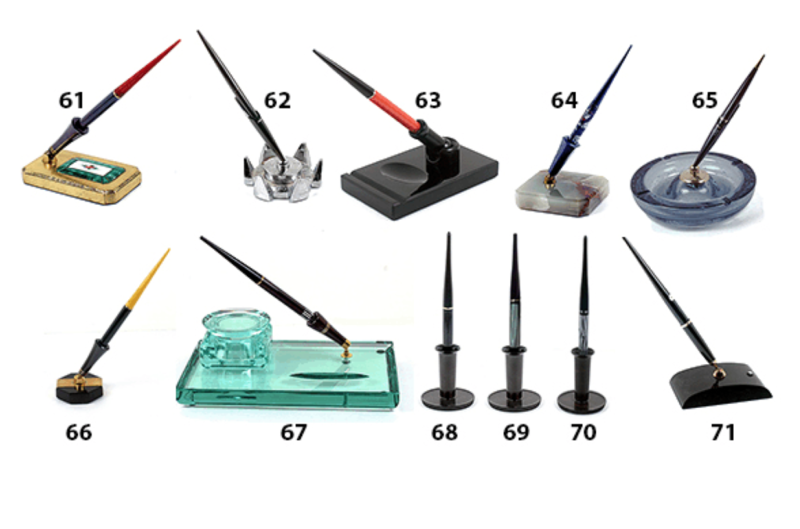 User can put either the fountain pen or the ballpen into the trumpet, and use the cap and regular barrel on the other. Magnetic trumpet in the center, still with original chalk marks. Fine nib. New-old-stock. Mint in form-fitted box (a little threadbare on the outside. Ball Pen refill and Fountain Pen converter both included. Box a tad threadbare. Check out our Catalog to view this item’s availability! Item #65 in Catalog #85. This entry was posted in Vintage Pen, Vintage Pens and tagged Ballpoint, Catalog, Catalogs, Desk Set, Extraordinary Pens, Fountain Pens, Go Pens, GoPens, Parker, Vintage Fountain Pen, Vintage Fountain Pens, Vintage Pen, Vintage Pens. Bookmark the permalink. Follow any comments here with the RSS feed for this post. Post a comment or leave a trackback: Trackback URL.